This is a lovely book. Waif would borrow it from the library until he had renewed it the maximum number of times, take it back, then a couple of weeks later he would choose it again! So we were thrilled to go to the monthly book sale one day and find that it was for sale for the princely sum of 20p. Woohoo!! The story is written in a repetitive, rhythmic style with a different animal “chasing after me” each page. 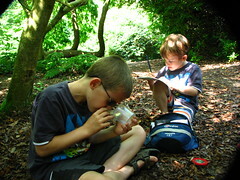 This makes it easy for your child to join in, even if they aren’t reading yet. 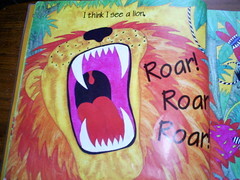 And it’s fun to try and remember which animal comes on the next page. 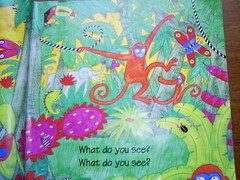 The illustrations are beautiful and colourful. 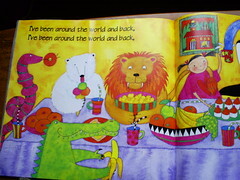 Oh – and there’s a happy ending, because all the animals come together at the end to sit down for a meal. 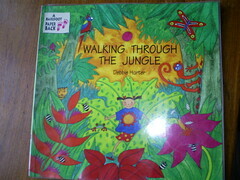 I thoroughly recommend this book for your 2-5 year olds.